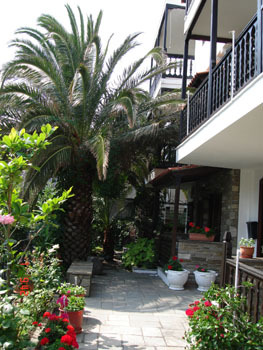 At the seaside settlement of Neos Marmaras you will meet "HOUSE PAPATZIKOS-TRADITIONAL GUEST HOUSE". It is a three-floor building with traditional structure, adapted for the demands of a contemporary guest room for all the seasons. Its accomodation capability is five double-bed rooms , three triple-bed rooms, one four-bed room and an appartment with two rooms with four-five-bed. All the rooms provide W.C., T.V., air-conditioning, fridge, kitchen and parking. 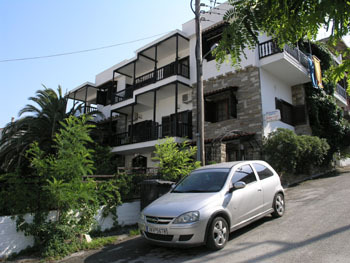 From "HOUSE PAPATZIKOS" there is the possibility for interestings escapes to the extensive physical environment and easy approach to the magical beaches of Neos Marmaras, to Agion Oros, to the traditional settlement of Parthenonas, to the touristic complex of "PORTO CARRAS" and to the archeological places of Halkidiki. The traditional colour and the contemporary comforts together with the friendly smile are in your disposal to make a different relation with the area, with the building, with the sea, with the people and finally with your self.